I had the Padres-Marlins game on my television, muted, this afternoon/evening while I did the dishes, ate cake, listened to music. At one point, while wiping off the kitchen counter, I watched as my screen silently displayed the highlights of an old baseball game. 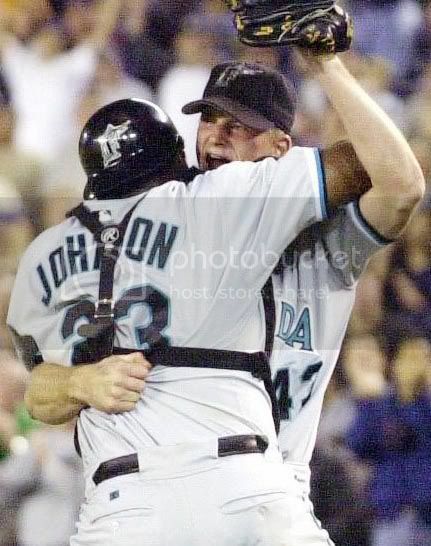 I saw AJ Burnett in a gray Marlins uniform celebrating and hugging catcher Charles Johnson and said mockingly to myself "We did it! A no-hitter!...with 8 walks..." He'd actually walked 9 in that game (against the Padres). I just found out that Arizona Diamondbacks pitcher Edwin Jackson threw a no-hitter (another no-hitter! the fourth [fifth counting Armando Galarraga] of the season) against his former team, the Tampa Bay Rays today. He walked 8 batters. It's a very subjective experience, of course, but that's exactly what synchronicity is.